Decred (DCR) is a new open, progressive, and self-funding crypto currency with a system of community-based governance integrated into its blockchain. At its core is a hybridized proof-of-work proof-of-stake (PoW/PoS) consensus system that aims to strike a balance between PoW miners and PoS voters to create a more robust notion of consensus. The project is a result of the theoretical proposals brought by proof-of-activity (PoA) and MC2 in 2013. Decred development started in April, 2014 with a single developer and expanded to include developers from btcsuite shortly thereafter. Decred is currently running on testnet preparing for the launch of the mainnet on 12:00 PM CST February 8th, 2016. There crypto currency uses Blake256 14-rounds algorithm for mining and there is a cgminer fork (source) already available for testing, though currently only getwork is supported and not stratum. The cgminer for Decred GPU mining is available below compiled for 64-bit Windows ready for testing on some of the few currently available mining pools that also run on the testnet (will be switching to mainnet after the official launch). The cgminer works on both AMD and Nvidia GPUs as the currently available ccMiner forks from tpruvot and sp do not currently work with Decred even though they do have support for Blake256 14-rounds mining. 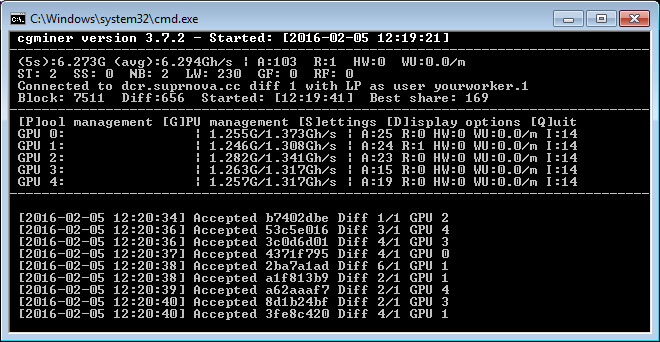 Trying out the cgminer for Decred (DRC) on an Nvidia GeForce GTX 970 has shown an average hashrate of about 1.3 GHS and trying the miner on an AMD Radeon R9 280X has shown a hashrate of about 1.3 GHs as well with both runningn at stock frequencies. There is already quite a lot of interest and a large community forming around the Decred crypto currency even before the official launch, so this is something that is worth checking out if you still have not heard about it. Also make sure you get ready for the official launch of the coin on Monday.